The Cormorant has been voted “Bird of the year 2010” in purpose to promote for the protection of the master fisher, which – after its return to German lakes, rivers an coasts – is being shot and chased away in thousands. Every year 15.000 Cormorants are killed. For many decades the Cormorant (Phalacrocorax carbo) was rarely present in Germany – the result of intensive pursuit by fishermen. Only due to the consequent protection by the Council Directive 97/409/EEC on the conservation of wild birds – this very day approximately 24.000 breeder couples live in Germany. Nevertheless, professional fisher tried to convince politicians and representatives of the administration of allegedly massive economic losses and that the cormorant poses a real threat to single fish. But cormorants do not kill off natural fish population and do not endanger fish species in a long term. It is rather necessary to fight for an ecological improvement of our waters, so that all fish and water birds have sufficient space for living. The birds which reach a size of 80 to 100cm and weights two to three kg prefer catching fish which they can capture without any great effort – they are nutrition opportunists. For this, particularly common and economically unimportant “whitings”, so as roaches, breams and other small fish are on the menu. 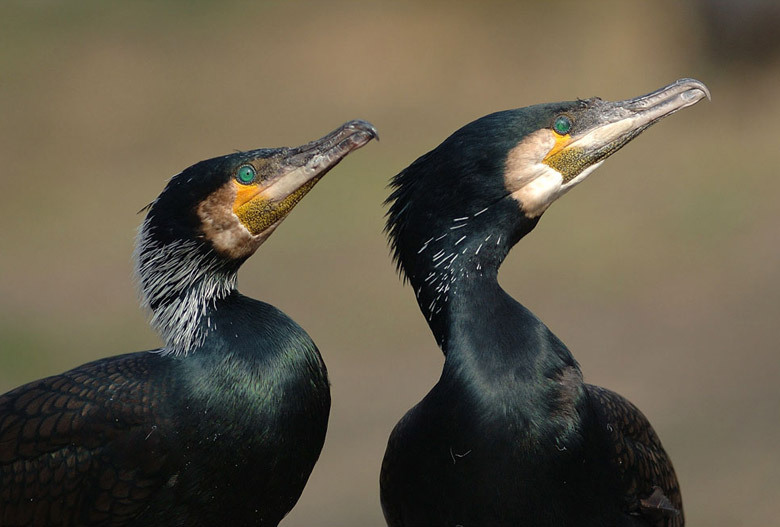 Some regional problems can occur at fish farms because of the cormorant. In this case solutions of how to avoid economic losses without endangering the natural population of the bird again, must be found all together on-site. For example fishponds can be protected efficiently by spanning wide-meshed and well visible wire gauzes over them and by chasing the birds away by using optical and acoustical tools. The cormorant, whose green eyes remind one of jewels, is a master in diving. He is capable of diving up to 90 seconds and up to a depth of 30 meters, thus it gains 300 to 500 gram of fish every day. 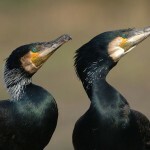 Compared to other water birds, whose feathers are greased, cormorants need to dry their soaked feathers by the sun and the wind after every dive to be able to fly again – a unique behaviour in the birds world. For this process tue cormorant spreads its wings in a characteristically posture at a place of rest. In tue past in China and in Japan cormorants have been tamed to catch fish. Even this very day the cormorant fishery is practised locally. A ring around their neck hinders them of swallowing the fish, so they disgorge them on the boat after catching them. The fisherman splits single fish for the birds which are held as pets or as farm animals. Commonly cormorants nestle in great rookeries on trees. Their acid excrement leads to a quick extinction of these trees and so it marks the characteristical picture of a colony. Their excrement, called guano, is locally used as an artificial manure. Large rookeries produce oodles of guano over the years. Consisting of the rests of the fish meal, the guano is enriched in Nitrogen and in Phosphorous which are very important elements for the vegetation. Yet the Inca and other South American peoples used the guano in purpose of increasing the harvest. In the middle of the 19th century some million tons of guano were transported to Europe, especially from the South American west coast. Since not only guano has been recovered but also eggs and birds were served as food for the workers, the population has almost become extinct.